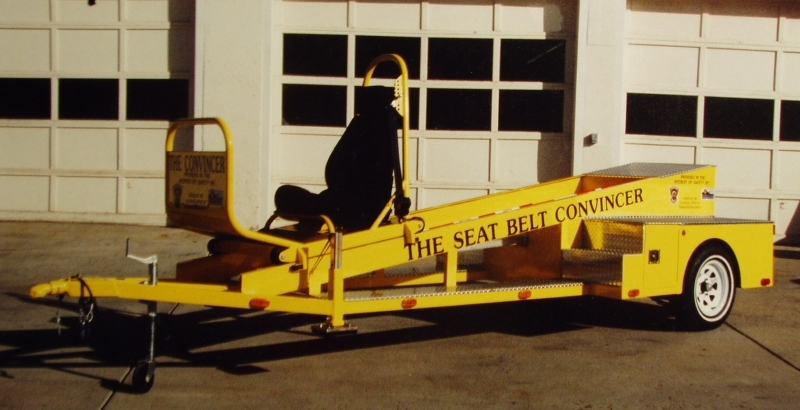 Seat Belt Convincer was designed and fabricated by Frank as an aide in teaching people the necessity of using seatbelts to avoid serious injury in a car crashes resulting in rollovers. In the demonstration, the "dummies" in the simulator that are not restrained by a seatbelt are thrown from the simulator in a terrifying real enactment of the deadly results of seatbelt negligence. Today, the Rollover Simulator is being used by law enforcement, schools, driver training and insurance companies worldwide. Self-propelled vehicle seat with safety restraints affixed to a light weight easily maneuverable single axle trailer. The Seat Belt Convincer simulates a 5 to 7 MPH Crash. The Seat Belt Convincer can be recycled approximately every 60 seconds. An automatic seat release makes The Convincer easy to operate. An easily repacked air bag is optional. The front trailer jack is fitted with a wheel for easy hand parking inside malls, schools, convention centers and other tight quarters. The Convincer is painted in a choice of colors for durability and good looks. The Seat Belt Convincer draws a crowd where it is exhibited. It facilitates personal contact with the public and never fails to leave a positive impression about safety belt use. An optional self-energizing air bag system deploys on impact and is easily repacked by hand. · Two wheel chocks prevent rolling. Treadbrite aluminum deck plate. The sled uses 6” channel runners. Weight (w/tools & generator) ..................................... 1,950 lbs. housings), side markers, clearance lights and license plate bracket with light. boxes provide approximately 9 cubic feet of storage space. Contact Frank for more information on purchasing a Seatbelt Convincer or get a brochure.